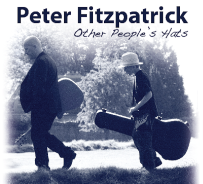 "Other People's Hats" is Peter's new album and is available from the Music Store. Available on CD (with instant download) and regular digital download formats. So, what is the story of "the hat" ? Other People's Hats refers to the songwriting process for many of my songs. I will wear the hat of the people in the song and try to get inside their world. It's also a nod to a famous songwriter who suspected I might have 'borrowed' his hat.... come to a gig and I'll tell you the story. If we all wore someone else's hat for a day it might make the world an even nicer place. To accompany the album "Other People's Hats" this is a collection of my songs as recorded by friends from around the world titled "Other People's Covers" (see? we can really hammer on that pun until we've used it up). They have also contributed a song of their own. This was a labour of love so go visit their webpage, join their mailing list, buy a CD, go to a gig.